All literature is the product of its history, possessing dormant traits of the author’s precursors and contemporaries. Whether inspired or incited by these sources, stories emerge from stories, and this history can be plotted into a literary genome of sorts. This is not to say that there are no new ideas out there in the ether, but simply that a writer can be viewed as the sum of his or her influences, both from life and literature. Consideration of these influences can lead to an efficient form of categorization: Gogolian surrealism can be grouped into one kingdom, eloquent renderings of the day-to-day into another, dystopian teen fantasy a phylum of its own. Focusing tightly into these categories reveals a particularly difficult problem in the relationship between new stories and their “host”: are these an imitation or a continuation of their genre? What causes a story tip from being a tribute to a knock-off? Why is it that a referential nod can so easily be misconstrued as mimicry? These decisions come, often arbitrarily, from the reader and are most often criticized in the realm of genre fiction. A reminiscent motif is suddenly met with closed arms: it’s been done, we’ve seen it before. Perhaps this opposition stems from the limitless, phantasmagoric potential that is inherent in genre fiction, but can’t a writer take an existing motif and reshape it admirably? Is it possible to create a work so tightly in the style of something else that this new body of work becomes canon, a worthy continuation of a lost genre or a dead author? Jeff VanderMeer’s exceptional novel Annihilation proves that such a feat is possible. It is the perfect sum of its parts and a blazing achievement that should not be overlooked. Let’s get Mendelian: cross-pollinate Ray Bradbury’s Sun Domes from “The Long Rain” with H.P. Lovecraft’s Dunwich Horror, discover the hidden recessive genes of Andrei Tarkovsky’s film Stalker, and you’re somewhere close to the greatness that is Annihlation. Some may find the book to echo ABC’s once-heralded series LOST, but VanderMeer sets himself apart by succeeding with his florid mysteries in every instance that LOST faltered. VanderMeer achieves genuine fear by way of fantastic, dizzying wonderment: the verdant Area X is escapist fiction at its finest, unsettlingly unknown yet aggressively captivating. VanderMeer’s reliance on familiar motifs provides his readers with a map of sorts, but also with the means to get utterly lost in his whimsical prose. Four women are selected to lead the twelfth exhibition into “Area X”, an unmapped, illusory greenworld that has confounded eleven previous attempts to understand its existence. It is a potentially fatal endeavor, as other expeditions historically led to the deaths of all involved. Annihilation is narrated by an unnamed biologist, who, together with an anthropologist, a surveyor, and a psychologist, are instructed to map the environs of Area X and keep a journal of their progress. At once it becomes apparent that The Biologist may be an unreliable narrator, carrying emotional baggage from her life before her involvement with the Southern Reach expedition corporation. She’s reactionary, inherently suspicious, and deeply committed to the natural sciences, and this connection with the unknown ecology around her renders her problematically distant from the rest of the group. The twelfth expedition quickly discovers a “topographical anomaly” in the forests near their camp: the top of what appears to be a buried tower emerges ominously from the growth. Perhaps closer to a well or a tunnel, its interior features a spiraling staircase, drilling endlessly into the earth. The women explore the upper strata of the tower and discover mesmerizing, luminescent plant growth, scurrying creatures, and a moss-like fungus that appears to be scrawled along the walls of the tunnel. The biologist changes. She develops an acute connectivity to Area X and discovers that the circumstances of their expedition may have had ulterior motives. As Annihilation progresses and the expedition breaks apart, The biologist attempts to learn more about Area X by way of understanding the changes in her body: she is drawn back to the tunnel repeatedly in search of whatever creature may be responsible for the fungal writing. The mysteries at work in Annihilation are what make it such a wickedly pleasurable read. Focusing on the biologist will consume readers with her encroaching madness, but she is the only entry point to learning about Area X and the Southern Reach, lurking somewhere in the shadows. 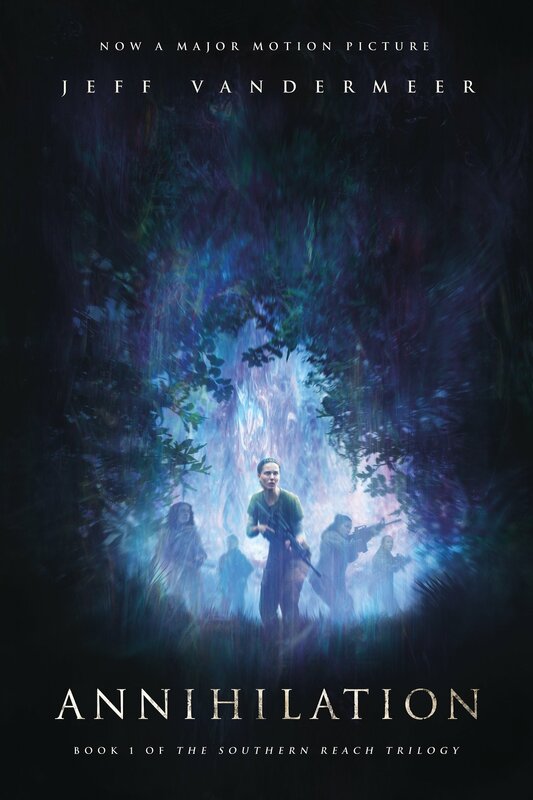 Part one of a three-part trilogy, Annihilation is an impeccable work of literary geomancy. Jeff VanderMeer possesses the ability to reshape the landscape of literary horror into something suspiciously familiar but entirely new, capable of inflicting awe, terror, and a rash of compulsive, fevered reading.